There have been some great posts on networking and impostor syndrome in the science blogosphere lately, which has prompted me to do some thinking about one of those pieces of advice that always crops up in such discussion: finding a mentor. It’s pretty generally accepted that mentorship matters at every career stage, but as someone early in my career, it seems that the first advice I’m given when I’m struggling is “find a mentor”. One mistake I think most of us make at least once is assuming that because we report to someone, they will serve as our mentor. Maybe it’s because finding a mentor is actually not a straightforward process. I can’t write a flow chart that will consistently find someone a mentor. Personally, I’ve generally found mentors simply by talking to professors outside of class, about something other than class, or talking to professors who I no longer take classes. However, I’m not exactly an introvert, so this comes more easily to me than it would to others. I also have a group of people I consider peer mentors. That is, someone at roughly your level, but with a specific skill set you may not have and the willingness to teach you that skill. The willingness to teach is what makes the difference between a mentoring relationship and teamwork to me. This year, I’ve been working with an undergraduate student on a research project, and frankly, I’ve learned more about how to get the mentoring I need from being in a mentoring position than I have from years of looking for mentors. He’s great at asking for help as soon as he runs into trouble, and has been able to get much more done than either of us expected. We also take the time to talk about things other than his research project, which I think has helped us learn how to communicate with one another more effectively. What advice do you have for finding mentors and for getting what you need from the experience? I think it’s very useful to establish some basic ground rules. I’ve blogged about this on my normal site (http://gears-tt.blogspot.com/2011/03/advisor-advisee-expectations.html if interested). I think it’s actually easier to seek out your mentor once you know what you want. (I know that sounds dumb.) But it may help to do some mentoring of your own first. Generally, you’ll treat your mentee how you would like to be treated and from that, you’ll figure out what you’re looking for. With that said, it’s still hard to find the right mentor and I don’t think you will find 100% of what you’re looking for in one person. You may need several mentors with whom you only discuss one or two things and seek out other mentors that might be able to help you in other areas. Thinking of my career retrospectively, you have a great point. 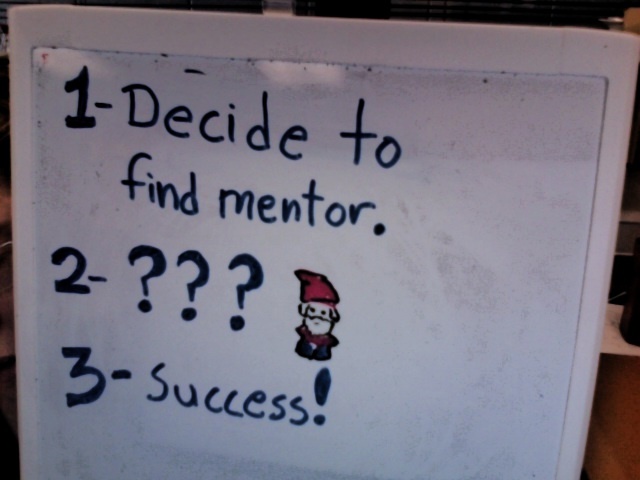 Almost none of my supervisors were mentors. Maybe one or two, and then only in a minor capacity. I never thought about it before, but wouldn’t it have been better if someone had taken up that role? Of course. Why should each young engineer have to seek out his or her teachers? And why should those teachers not get credit for what they have done? My mentors were departmental experts. Fluid flow, heat transfer, distillation. Whatever I needed at the time. Sad when you think about it. Mentoring should be a supervisory requirement. Supervisors should be evaluated on their mentoring ability. My current career is writing. Who are my mentors? Books, internet articles, the school of hard knocks. The environment of eBooks is changing so quickly that I don’t really think there are any experts, just a lot of opinions. Maybe my career as an engineer was good preparation for a field with much theory and little practical knowledge.